For those who like to take in the countryside, to experience travel a little slower, Australia doesn’t have the world’s greatest railroad, but it does have just over 33,000 kilometres of track. And that’s nothing to be sneezed at! And rail may not get you to every nook and cranny of the country, but it can get you to every state/territory capital bar Hobart. 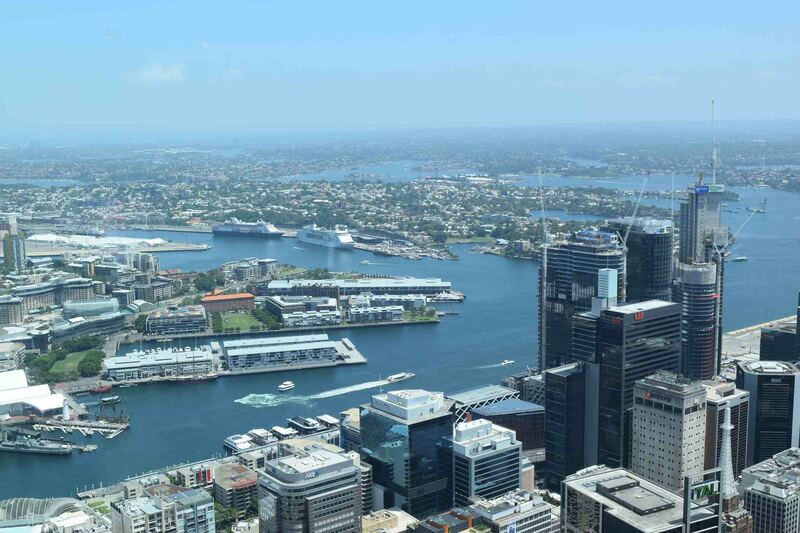 To get from Brisbane to Perth solely by rail is going to take you the best part of the week, but to be honest – one travel wish I still have is to take the train all the way from my home in Melbourne to Perth. The Indian Pacific may cost in the thousands of dollars, but then the journey is over 2,700 kilometres. Personally, I must admit that I haven’t been on a lot of rail trips in my own country, which now that I think about it, is a bit sad! Because many of the rail journeys in Australia are actually rather epic and memorable. For the record, a long time ago I took the train from Melbourne to Sydney. Can’t exactly remember when that was, I think I was a teenager. And when compared to driving, it’s a pretty good option. Victoria’s an attractive state although it does get a bit dry and brown the further north you head. Unfortunately, there are no superfast trains in Australia, which means that this journey takes over 11 hours to go the 900 ish kilometres. The cost for an economy seat is around $130 AUD ($1AUS = approx. $0.71USD). That’s on the expensive side I guess, but comparable to airfares and it will take you from the centre of one city to the centre of another, saving the cost (in Melbourne quite substantial) of getting to and from the airport, and a far less stressful experience. But hey, you lose a full day. I took the Overland train Melbourne to Adelaide back in Year 11 or 12 when we had a school trip to the Adelaide Fringe Festival. That was a pretty smooth ride, but we went overnight and only had seats. I imagine in the day time it’s quite a scenic route. There is a day train too. At the moment there are a lot of railworks going on, so it’s not running every day, but that won’t last. At $99 for a seat, it’s pretty good value but does take a rather long 12 hours for a journey a little less than the distance Melbourne to Sydney. There is also a train Sydney to Adelaide which I believe turns into the Indian Pacific. Which is the amazing train than runs East-West (and vice versa!) to Perth. 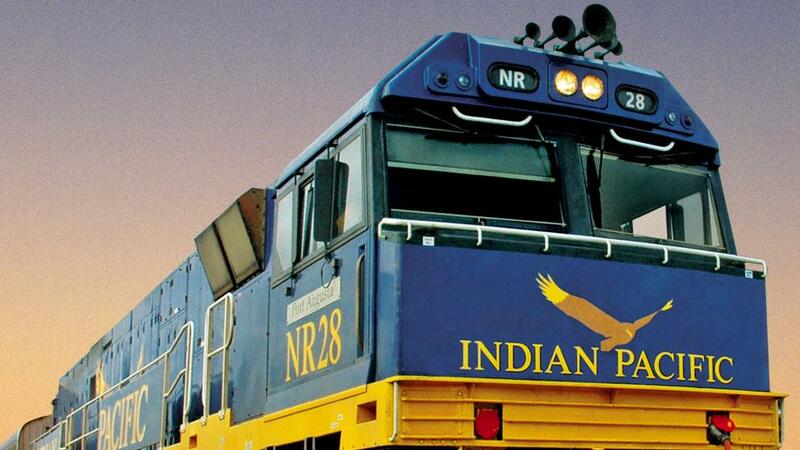 A gold class berth Sydney to Adelaide on the Indian Pacific is $899. So now we are getting into really expensive territory, but also decent comfort too. But this is now 24 hours as it isn’t a straight line, in fact it goes via Parkes and Broken Hill, which makes it quite a journey. 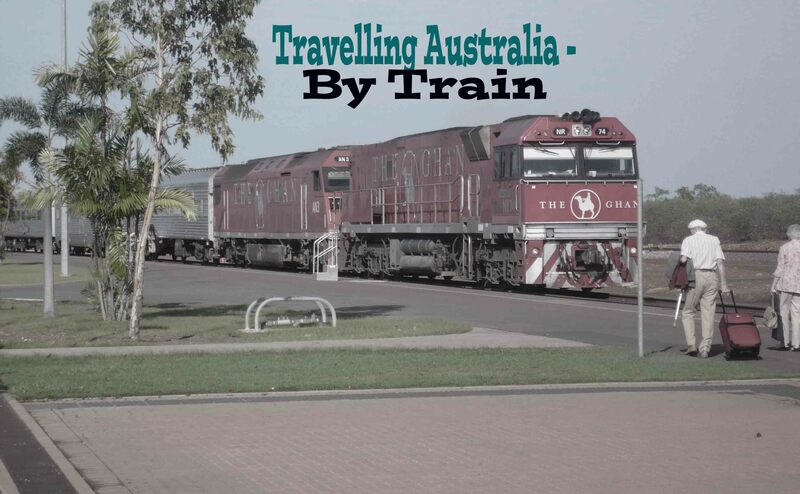 Then Adelaide to Perth on The Indian Pacific is another day and half or so – there is a long wait in Adelaide to allow people to alight for a few hours. Imagine though, crossing the Great Australia Bight (this part of the southern coastline which looks like someone bit into it), across deserts, it must be the most exciting of Australian rail trips. This starts at $1839 for a gold class berth. The other main Australian train I have taken, albeit not the full journey. It goes from Adelaide to Alice Springs to Darwin. I took it from Darwin to Alice Springs. Basically it cuts down the centre of Australia. It’s a stunning journey that takes a couple of nights. 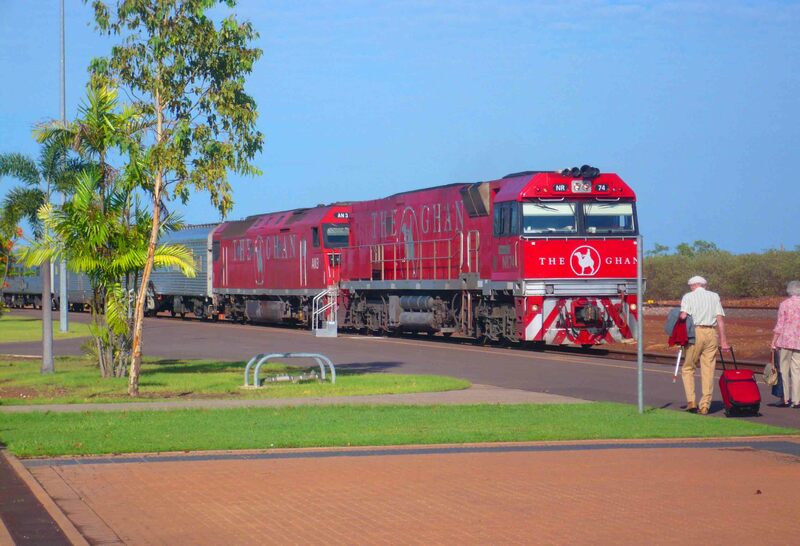 It stops in Katherine (and possibly other places) where tours are available whilst the train waits. You’ll find this in Adelaide too as part of the Indian Pacific journey. Two diesel engines pulling proudly and strong! The ride is comfortable and through some amazing scenery. Adelaide to Darwin one way is a bit over $2300. 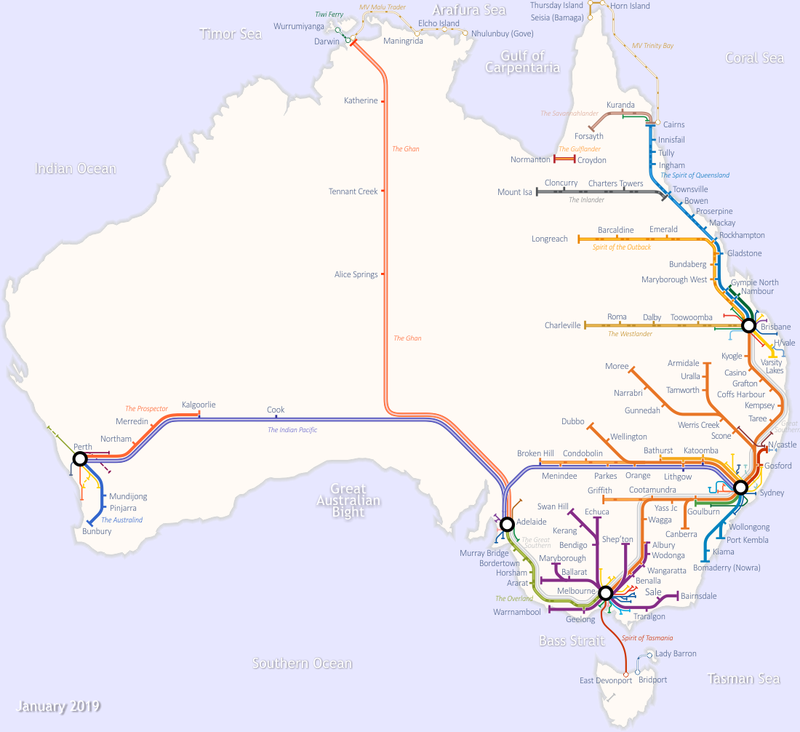 There are other trains, especially Queensland and along the eastern coast. Sydney and Brisbane have a good connection on the XPT. And with the more epic journeys of the Ghan or Indian Pacific, and others, if you book way in advance you can score discounts on the prices mentioned, and indeed there are often specials. I found this site – railmaps.com.au very helpful in writing this post. And it has links to help you purchase tickets. Thanks for reading today – and May the Journey Never End!